In Turkey, meals are family and social events and can last for hours on end, especially if you're dining out. Turkish cuisine is particularly famous for its wide selection of appetizers and starters. When I say appetizer or starter, I don't mean a small dish before served before the main meal. I'm referring to several rounds of delectable hot and cold treats that often end up being the main attraction. In Turkish cuisine, these mini-courses are called 'meze' (meh'-ZEH'). When dining out, 'meze' selections are usually brought out and presented on a huge tray for diners to choose from. This is a spectacular experience. The chosen 'meze' are then brought out and served one by one. 'Meze' is always eaten slowly together with drinks and a lot of good conversation. The first round of 'meze' is always cold selections, followed by the second round of hot dishes. I'm often so full after hours of sampling 'meze,' that I don't have room for the main course. 'Meze' is usually accompanied by either soft drinks, or wine and Turkish 'rakı' (rah-KUH'), an anise-flavored liquor similar to ouzo and arak. Old friends often choose to gather around what's called a "rakı table." Here, they choose to enjoy their favorite 'meze' dishes and reminisce over a bottle of 'rakı' and skip the main course altogether. In Turkey, you'll find some form of 'meze' wherever you go. 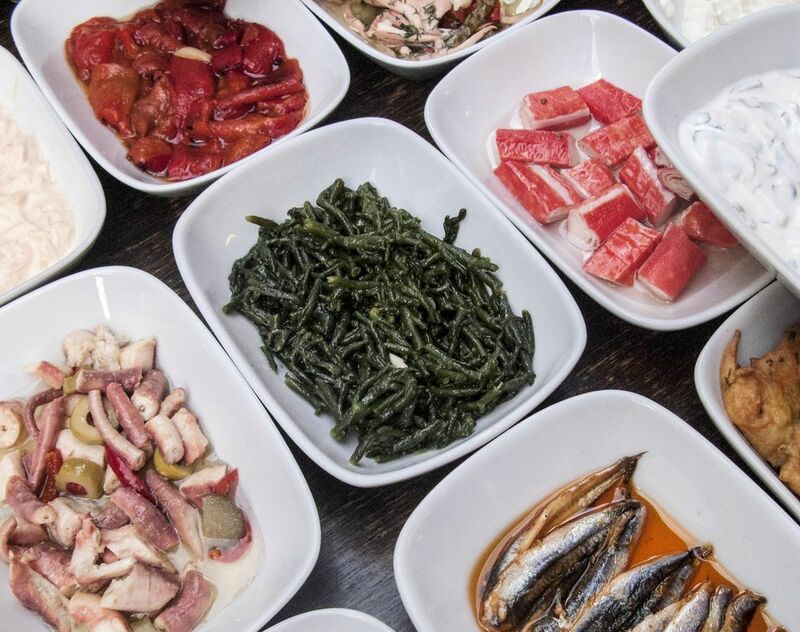 Whether you eat a modest meal at someone's home, run down to the corner restaurant, or go to a fine restaurant in one of Turkey's big cities, you'll always be presented with several delicious 'meze' dishes to choose from. If you enjoy having and appetizer or starter before your dinner, you'll definitely appreciate Turkish 'meze' and the Turkish way of dining. There are few cuisines in the world that can rival Turkish cuisine when it comes to 'meze.' The selection of 'meze' that's offered before your meal depends on what you choose as your main course. Completely different line-ups of 'meze' are traditionally served with either fish or meat fare. How is that for a power line-up of 'meze'? Keep in mind, these are only the most common, standard 'meze' dishes. There are endless variations to choose from that change from region to region and from season to season. Try your own combinations and create Turkish-style 'meze' of your own.